I received coupons from Driscoll’s for my berries in hopes that I may write about them. All opinions and text are my own. 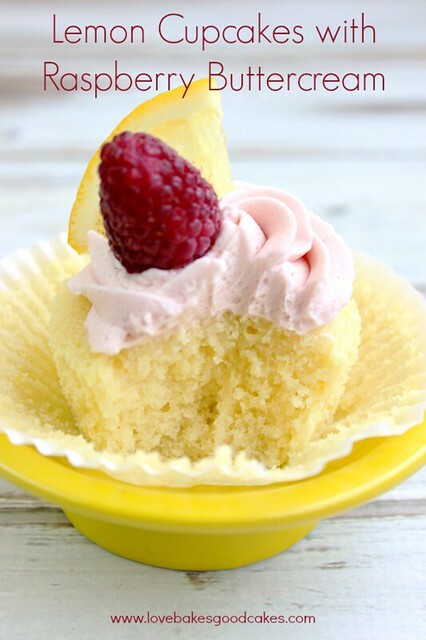 Y’all, bookmark, print this recipe or pin these cupcakes NOW! Seriously, go do it … I’ll wait!! 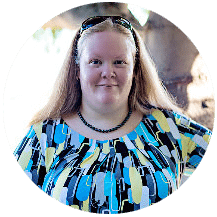 A few weeks ago, I was reading some of my favorite blogs on BlogLovin’ …. 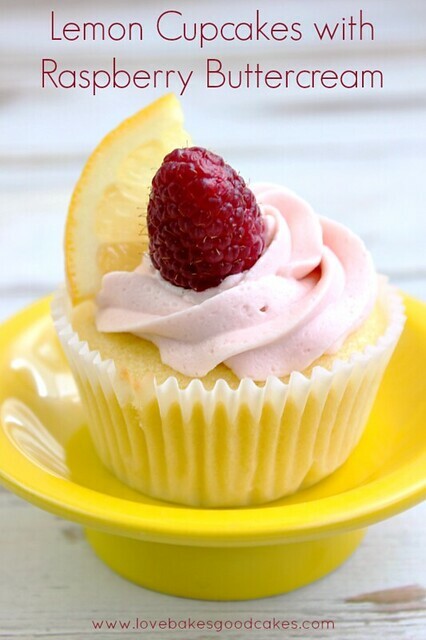 and I ran across this Perfect Triple Lemon Cupcakes post from Crazy for Crust. I pinned it, but I could NOT stop thinking about them! I has this idea to use up some raspberries I had in the fridge and I knew Dorothy’s cupcakes were the perfect match for the Driscoll’s raspberries! Preheat oven to 350°F. Place cupcake liners in the wells of a muffin pan (you will need about 15). Set aside. In a medium bowl, combine the flour, baking powder and salt with a wire whisk. Set aside. In a large mixing bowl, mix the butter and sugar until thick and yellow. Add eggs, one a t a time, beating well after each addition. Add the vanilla and lemon extracts, the lemon juice and lemon zest; beat well. Add half of the flour mixture, followed by all of the milk, then the remaining flour mixture; mixing just until each addition in combined. Do not overmix. Divide the batter evenly into the cupcake liners. Bake for 13-18 minutes or until a toothpick comes out clean. Allow to cool completely before frosting. While the cupcakes are cooling, prepare the frosting. Puree the raspberries in a food processor. Strain the raspberries through a sieve (or cheesecloth) to remove seeds. 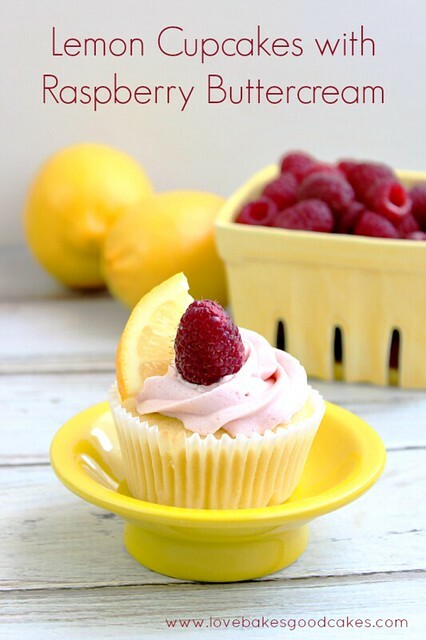 Place the butter, salt, strained raspberries and raspberry extract in a mixing bowl. Beat with an electric mixer until smooth and creamy. 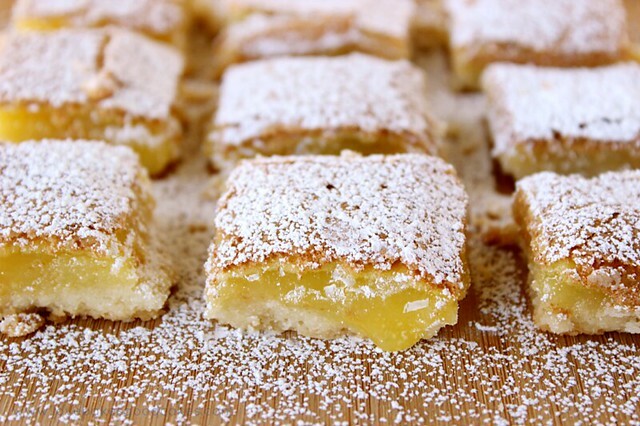 Gradually add the powdered sugar, beating on low speed until thoroughly combined and smooth. Top cupcakes with frosting. If desired, garnish with a lemon wedge and a raspberry. 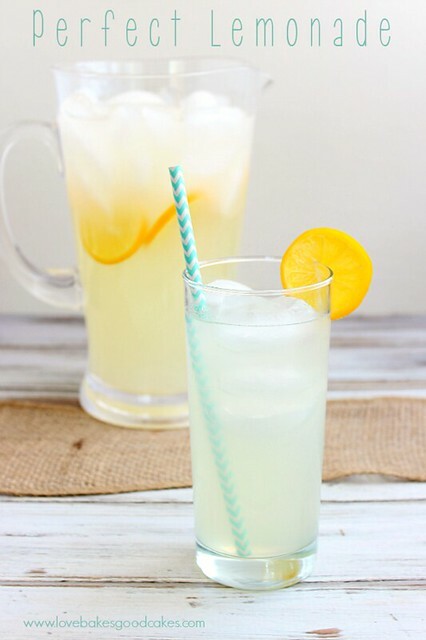 « Cinco de Mayo Round-Up – More than 100 recipes!! mmmmm looks awesome!! !Thanks for sharing a recype! These look amazing!!!! I want one now!!!! I need to save this for a summer treat…they look amazing. Thanks for sharing on the Thursday Blog Hop! 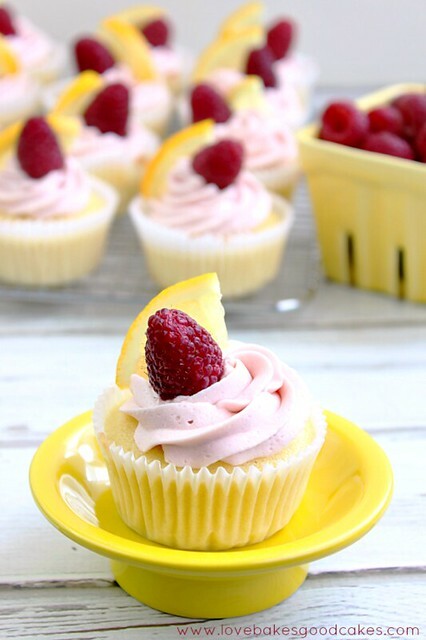 They look sooo delicious, love lemon and raspberry combo! Pinning your recipe to try out later 🙂 Thanks for sharing! Great Cupcakes, Jamie! Hope you are having a great weekend and thanks so much for sharing your awesome recipe with Full Plate Thursday. 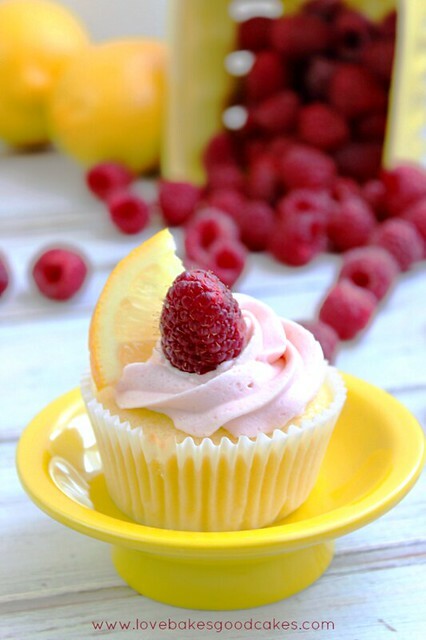 What a fantastic combination lemon and raspberry. thank you so much for bringing them to foodie friday. Pinned. Thanks for linking up at Family Fun Friday. Just wanted to let you know I'm featuring your cake this week. Hope you'll stop by and share again! They even look cheerful and sunny! Thank you for sharing, Jamie. Ok, you know how much I love LEMON and there's nothing I love it more with than berries!! These cupcakes not only look delicious, but also beautiful…..perfect for Mother's Day, baby showers, or any special spring occasion! Love them! How lovely, I've yet to try lemon and raspberry together but I can imagine it's a delicious combination. Thanks for linking up to Sweet and Savoury Sunday, stop by and link up again. Have a great weekend!! Can't get over how gorgeous these are, Jamie! I made the lemon cupcakes yesterday (used a different icing) and these are the best lemon cupcakes I have ever had…EVER (and my mom can bake!). 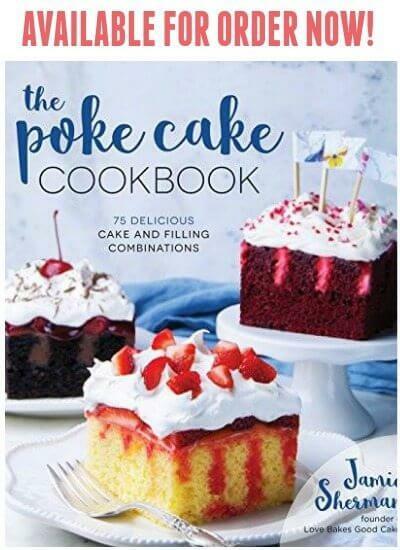 Thank you for sharing this recipe…it is definitely a keeper!! !